Today was the 4th annual Open Shuhada Street demonstration where activists and organizations from all over the world join in solidarity with the Palestinian residents of Hebron/Al Khalil , to demand the opening of Shuhada Street to Palestinians and an end to the Israeli occupation. Shuhada Street used to be the principal street for Palestinians residents, and their businesses. 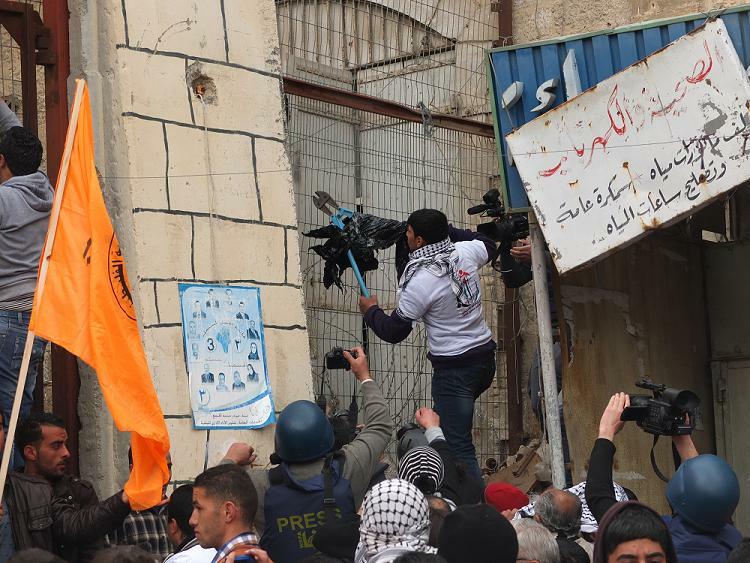 It was also a very active market place in the Palestinian city of Hebron/Al Khalil. 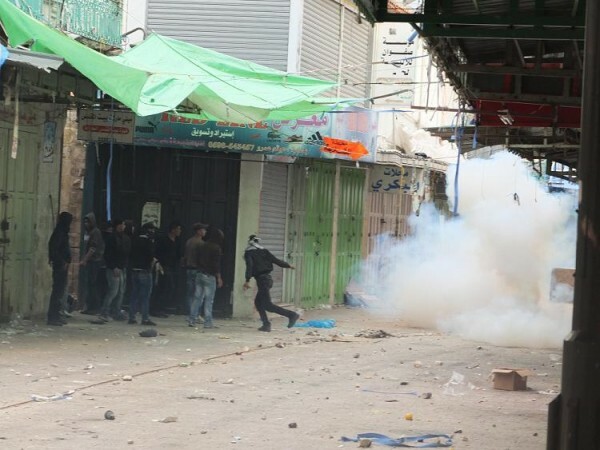 Today, because Shuhada Street runs through the Jewish settlements of Hebron, the street has been closed to Palestinian movement and looks like a virtual ghost street which only Israelis and tourists are allowed to access. Hate graffiti has been sprayed across the closed Palestinian shops and Palestinians living on the street have to enter and exit their houses through their back doors or, even sometimes by climbing over neighbor’s roofs. The demonstrators gathered after Friday prayers where around 1000 people marched through the streets towards the entrance of Shuhada Street . We came across a fence which was once also an entrance to Shuhada Street. 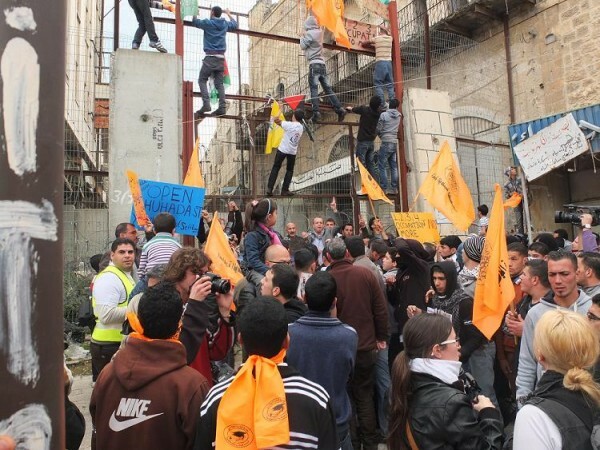 Several people scaled it and hung Palestinian flags from it. Another young man tried to open it with wire clippers. 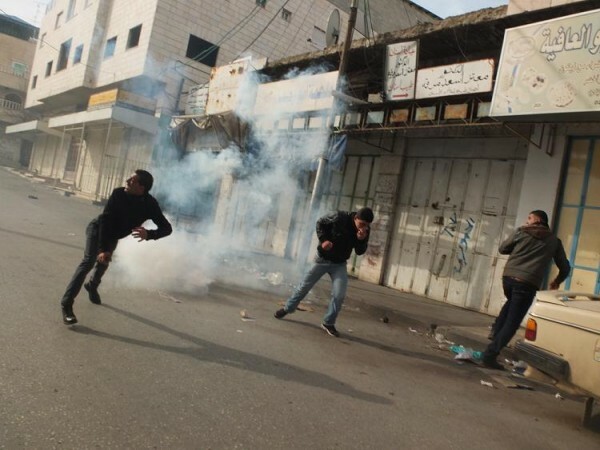 When demonstrators stood in front Bab Baldier gate which blocks Shuhada street the Israeli army sprayed the crowd with skunk water before throwing stun grenades into the crowd. Dozens were taken away in ambulances after being hit by rubber coated steel bullets or for treatment for excessive teargas inhalation. One journalist was hit in the leg with rubber coated steel bullets. 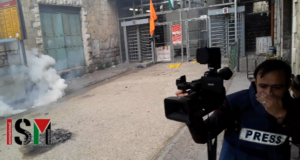 The clashes continued into the evening when an Israeli Soldier threw a stun grenade directly at three international activists.